I’m traveling again this weekend and was trying all this week to finish everything in my fridge before going. I have Hummus leftover, it’s a shame to throw it, no? I decided to fry some meat and pine nuts, and this fabulous recipe is the result. I wonder who had this idea to top the Hummus with meat! 1.In a food processor, put the drained chickpeas with the rest of the ingredients (Tahina, lemon juice, garlic, salt and olive oil) and blend until you get a smooth paste. This is now Hummus. 2.To make the topping; melt butter in a frying pan and sauté the onion, add the pine nuts and fry for 2mn. Add the meat and cook for 10mn or until they are well done. Sprinkle with black pepper, cinnamon and salt. Add the molasses and stir until well combined. 3. Top the Hummus with meat, drizzle with more olive oil if desired and garnish with parsley. Serve with Lebanese (or pita) bread. This entry was posted in Appetizer, Recipes and tagged appetizer, chickpeas, Food Blogger, garbanzo beans, Hummus, Hummus b-lahme, Lebanese food, lebanese food blogger, maya oryan. 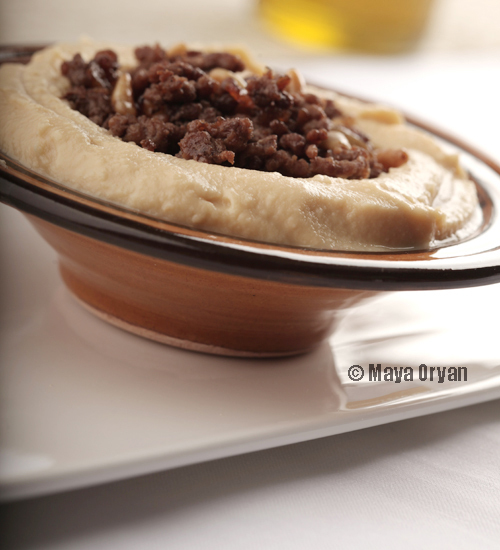 food stylist, Mayas Ingredients, mezze, middle eastern food, vegetarian food by Maya Oryan. Bookmark the permalink. I make it now when we are in a hurry to prepare lunch sine I always have homemade hummus in the fridge…YUM. Hummus is delicious! Dip, lunch, appetizer, it’s simply great! Ha, ha, ha! My husband would LOVE you! Adding meat to hummus. He loves hummus and he love meat. I am not even going to tell him about this!!!! Ha, ha, ha!